The stage and cine actor of the sixties and seventies, by the name of Wickrama Bogoda, recently left us - when he was 72. He was an active member of 'Ape Kattiya' headed by beloved dramatist Sugathapala de Silva. There were other young artistes such as Tony Ranasinghe, G W Surendra, Cyril B Perera, Tissa Abeysekara, Dharmasiri Wickramaratna, Augustus Vinayagaratnam, Anula Karunatilaka and Prema Ganegoda. More or less, they all migrated to cinema medium as actors, scriptwriters, lyricists, producers and directors. Bogoda didn't go beyond stage and cinema, if I remember right. He maintained a low profile in popularity, even though he was chosen to play key roles in 'Gam Peraliya'. Performing as Tissa in 'Gam Peraliya' is a rare chance for an actor. The other three actors were Punya Heendeniya, Trelicia Gunawardane and Henry Jayasena. This is a rare occurrence in Sri Lankan cinema. 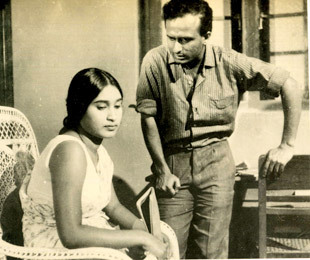 Wickrama Bogoda had another chance to act in Dr Lester James Peries' most popular feature film 'Golu Hadawatha' as the teenage lover opposite Anula Karunatilaka, the then much loved heroine of the silver screen. They met earlier in stage with Dharmasiri Wickramaratna's 'Ran Thodu'. Bogoda had another different role in the film 'Binaramali' (opposite Swarna Kahavita) by Mudalinayaka Somaratna, as a travelling trader from the town to a remote village where he meets the village damsel. He played a complete different role in Dharmasena Pathiraja's first feature film 'Ahas gavva' as a carefree youngster. His capabilities were much captured by Pathiraja in a more cinematic acting form. Although Wickrama Bogoda's cine appearances were few in numbers, his acting is memorable to our generation. Basically a stage actor turned into a cine actor, Wickrama Bogoda is an extraordinary actor in Sri Lankan arts. Quite unfortunately the cultural authorities never recognized him for his talents. But our generation of sixties and seventies will always salute him as a memorable actor of our times!